Whether you’d prefer the subtlety of off-white on white that comes with the white mother of pearl dressing table, or the soft definition of the grey, or even the rich yet delicate floral effects of the black, we recommend following your heart to choose what truly excites you here. 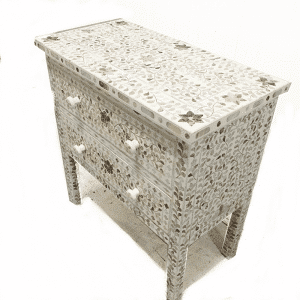 And for those who prefer colour, our mother of pearl inlay dressing table can be made to order in any colour you can see in our inlay collection. 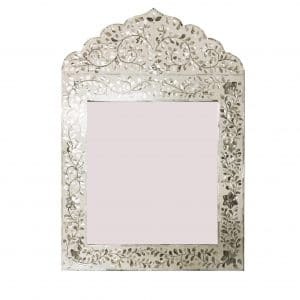 For a matching set, a mother of pearl mirror or jewellery box could complete the look in a bedroom. Talk to us about having your bespoke accessory made to order. 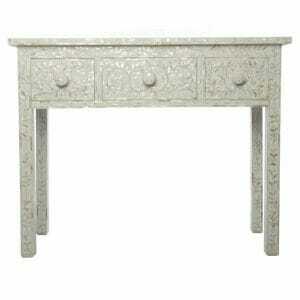 Why Choose A Mother of Pearl Dressing Table? 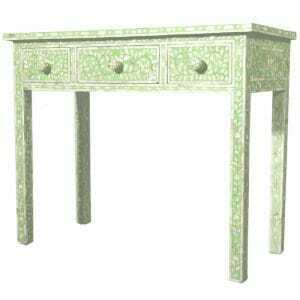 Introduce a whisper of floral elegance into a bedroom with a dressing table traditionally made for Royal clientele. 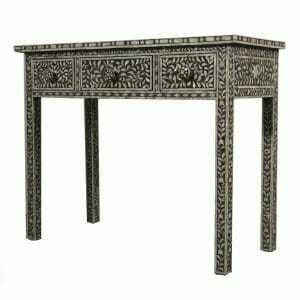 Using the ancient techniques that have sustained in ornamented furniture making in Rajasthan, the hardwood Indian dressing table is put together with skill, patience and incredible artifice. The ethically sourced mother of pearl shell is hand carved and fashioned into the delicate pieces that adorn the table for beauty in meticulously arranged floral patterns. Neatly bordered and symmetrically designed, the inlay dressing table strikes the perfect balance for a look that is both stately and feminine. Beautifully offset with a matching mother of pearl mirror, why not order a bespoke set in the colour of your choice? With the exact measurements required and the ability to request the division of drawers as you would have them, we offer a luxury bespoke dressing table at no extra charge for the service. 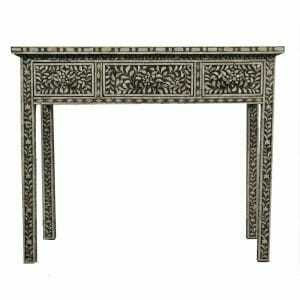 This, like all our furniture, will be hand made in Rajasthan by master craftsmen and will end its journey from the orient at your door. 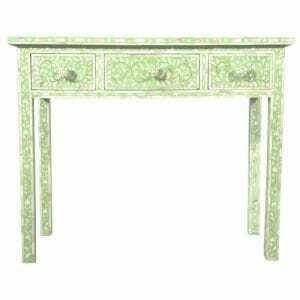 How Do I Style-Match a Mother of Pearl Dressing Table? 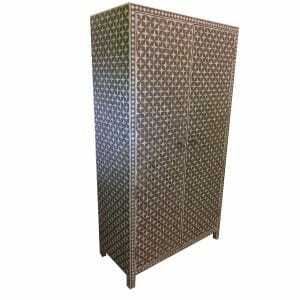 All our inlay furniture can be made to order in any of the colours you see on our website. For a closer look at these, get in touch and request more images from us. 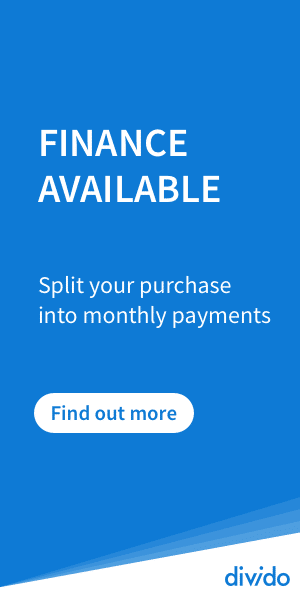 We are happy to answer any questions you have that may help you make your decision. 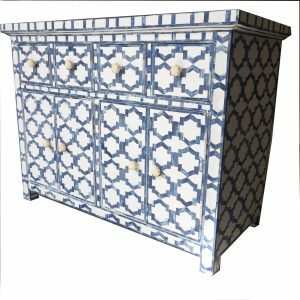 Our inlay furniture collection offers variety and while we feel there is likely to be something for almost everyone in our collection, it may just be that you require that certain something to be made for you ‘just so.’ On these occasions, just call or email us and let us know your requirements. We’ll answer you directly and let you know the exact cost as well as when you can expect to receive your bespoke furniture. We’ll check over the details with you and let you know just what can be done. The versatility of mother of pearl to fit in beautifully with so many different décor looks is thanks to its light-catching surface, which lifts and creates space in a room. It also softens the effects of the coloured inlay resin, which means you can be bolder in your choices. For the subtlest of looks, we recommend the white mother of pearl dressing table, which offsets the shimmer and light play in the nacre with a low contrast effect. This enhances the enchantment factor when light catches the mother of pearl from moment to moment with unexpected allure. 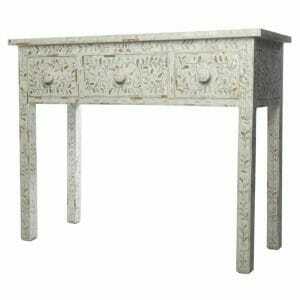 Floral patterns in the nacre inlay tend to work best with the white dressing table. This is also the most stylistically adaptable look. It will match any other colours and suit nearly every colourscheme, followed only by our grey mother of pearl dressing table in terms of versatility. The grey dressing table will offer up a touch of soft contrast and highlight the patterns beautifully, while looking good against nearly all wall colours. For a high contrast definition with aesthetic effects you cannot fail to be impressed by, the black mother of pearl combines elegance with evident sophistication. 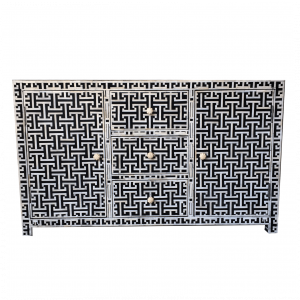 Match this with dynamic, patterned furnishings with strong colours, black accents and materials with a hint of shimmer, to complete the look in any bedroom. 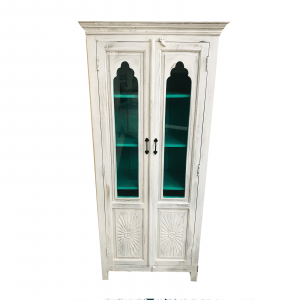 How Do I Choose Coloured Mother of Pearl Furniture? When choosing colours, we recommend following your heart first and your current home décor choices second. 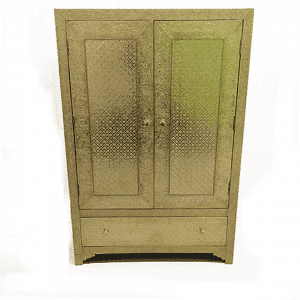 When buying mother of pearl furniture, you are investing in a piece of well made, solid Indian art that is made to last you beyond fad and fashion. With a timeless look of its own, it transcends the changing styles we like to infuse our homes with. So follow your passion. Something that excites you when you look at it more than once, is likely to be the one for you. When we follow our hearts with these choices, we find that our future home purchases are likely to co-ordinate just fine, so long as we make these choices using the same criteria. 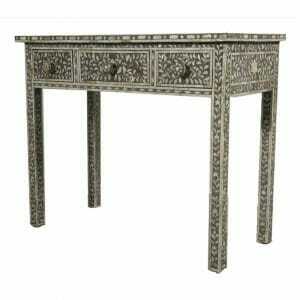 Can I Order Matching Mother of Pearl Accessories With My Desk? 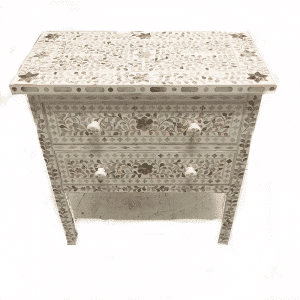 The colourful array of Indian mother of pearl furniture is thanks to the resins which are dyed by batch and give the decorative art of Indian furniture making its signature look. When ordering your perfect coloured hand made Indian dressing table, you can order one of our many accessories to match, from jewellery boxes to tea trays, get in touch with us for ideas or let us know what kind of accessory you would like us to have hand made for you by the artisans who welcome original ideas and love an opportunity to create something unique, treating every furniture project as the original creation it is. 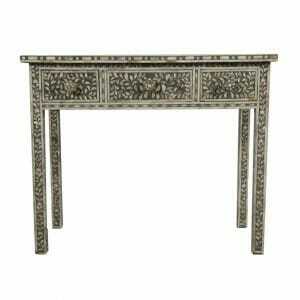 Can I View My Indian Mother of Pearl Dressing Table Before Buying? If you happen to be within reach of Brighton, we couldn’t recommend our home city enough. We’re based in the North Laine, which is laden with bohemian delights and boutique beauties, not to mention a choice of world food from some of the UK’s most ethical entrepreneurs. And if that’s not enough, we’re by the sea. So come and see our shop and showroom. We can arrange a viewing by appointment for you, so call us in advance to make sure we have your preferred item available. 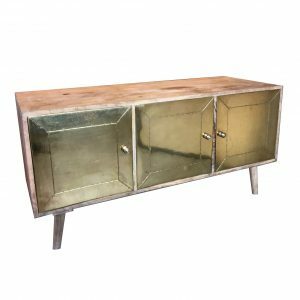 Of course, if you can’t make it to Sussex to see us, we have an extensive range of images we can send you if you need extra help making your decision and we are happy to help make your online shopping experience as good as seeing the piece of furniture in front of you. Call us and ask us anything you’d like to know about our furniture and we’ll share the benefit of over 20 years experience with you. In Brighton you’ll find a high concentration of businesses offering fair trade, ethically made and sustainably sourced produce and crafts and we are happy to be part of that thriving, ever-growing community, selling eco-friendly furniture that is traded with the interests of the makers protected, along with the culture from which Indian Inlay furniture originates, where the artisans are honoured for their work and well paid, helping everyone flourish, fairly.